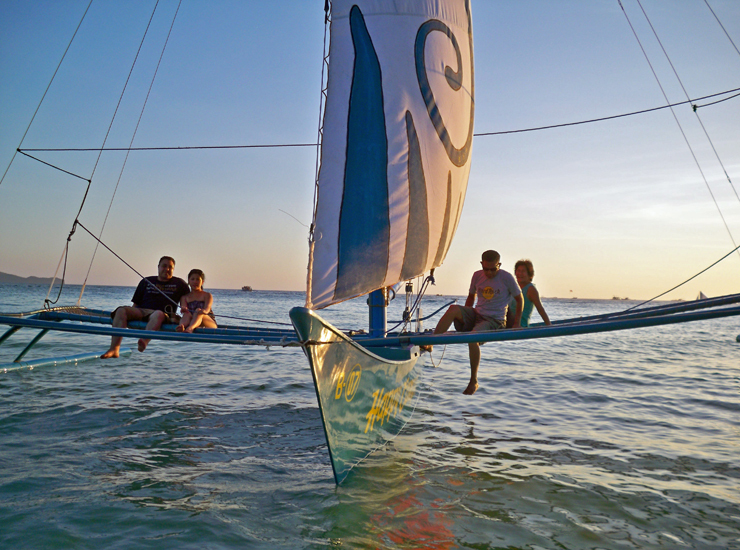 Boracay offers a lot of outdoor activities you can imagine. It is one of the most beautiful places in the Philippines, but more developed than any other. The beaches are one of the main attractions of this island and are great for: sailing, scuba diving, snorkeling, island hopping, surfing, jet-skiing, etc. 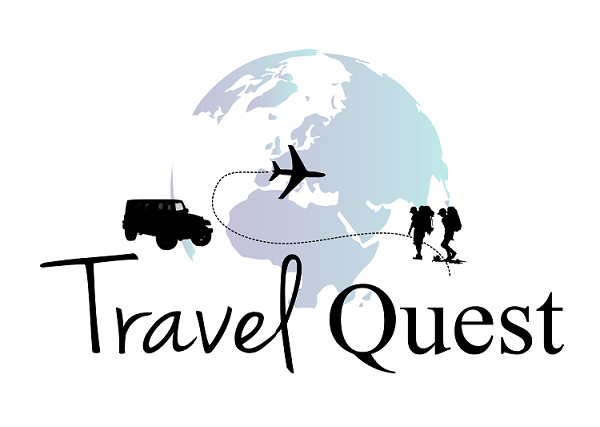 To avail discount you have to go by group at least 6 people, or pay extra if you want a private tour. 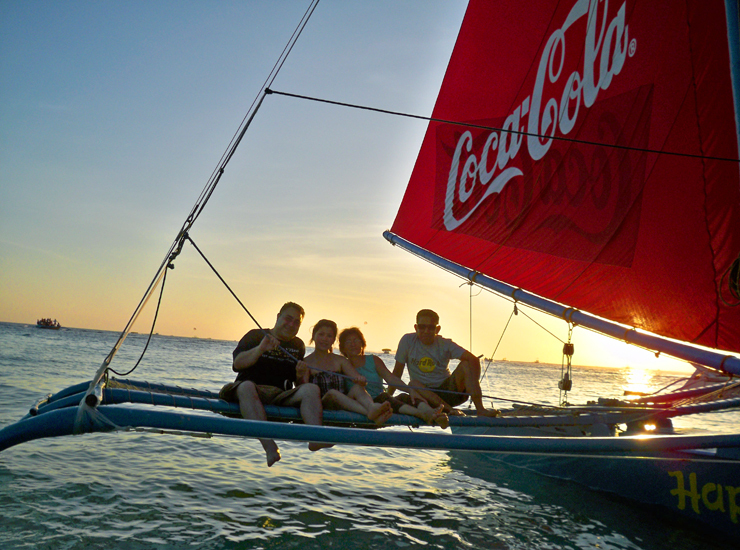 We decided to go on our own tour for two attractions: the Helmet diving and sunset sailing for Php3500 or about USD60. I always wanted to try the Helmet Diving. I am not a good swimmer but I like the idea of under-water adventure. I bring my husband with me to share this wonderful experience. We met the diver/tour guide on Station 2 15 minutes walk from our hotel.. We boarded to a speed boat to where they do helmet diving. They provided all the gear on this tour. After a short briefing from our guide, we immediately prepared ourselves to go down the ladder. Once we stepped at the ladder, the 25-kilo helmet was placed on our heads. Someone help us to go down until they release the helmet. It took a minute for me to get the hang of it. Sometimes, water enters the helmet and it freaks me out! But it was eventually removed so its all good. The water was about 12 feet deep, once your underwater it was magical an out-of-this-world experience to see fishes of all shapes and colors surrounding you and beautiful corals too. You can feed and play with them at the same time. The diver took pictures/videos for us and signaled for us to kneel on the floor for various poses. The only down part is that the weather that day is pretty cloudy and there's some big waves along the way. This is the first time we went to diving and our diver/tour guide rest assured us that we are taking care off. Too bad I can't remember his name or the tour agency he is working for. For those who want a serene and romantic experience. Sunset Sailing is the perfect date night. WOW! That sounds like such an amazing experience. 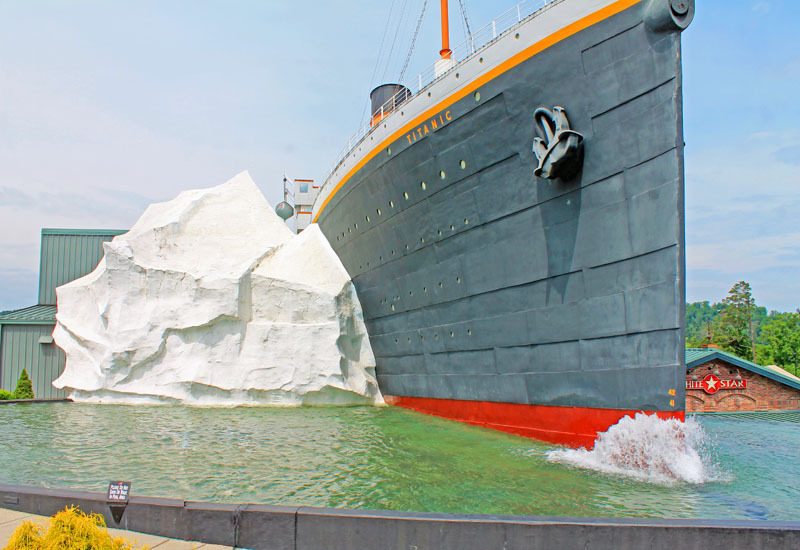 As someone who can't swim, I usually steer clear of the water, but that looks so cool! I've always wanted to try the helmet diving as well. 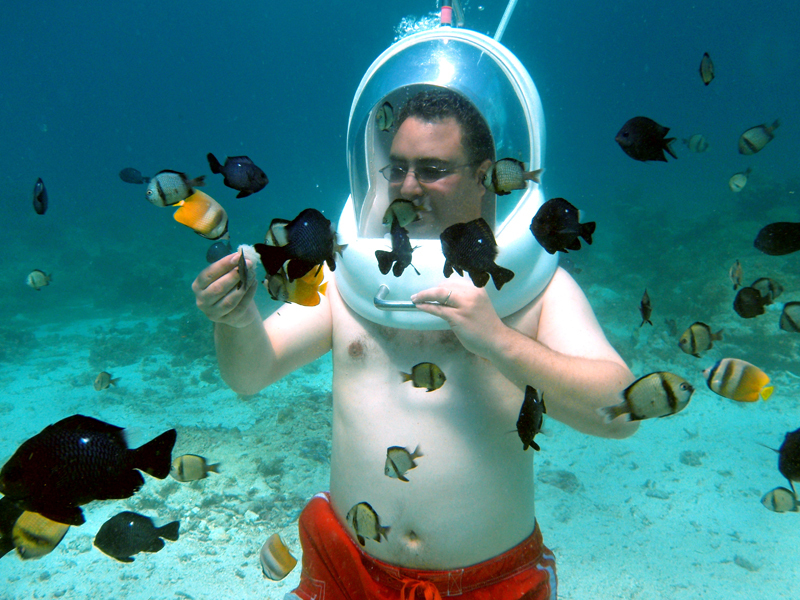 It looks like such a fun way to explore without having to be a certified diver. What a great adventure! I love anything that will give me underwater! I love swimming underwater. This looks like a lot of fun. I would love to do a sunset sail anywhere. I have friends who are avid divers and tout helmet diving as a great intro to diving. I would totally love to try it one day. $60 isn't a bad deal for a dream excursion like this. Helmet diving sounds very interesting. 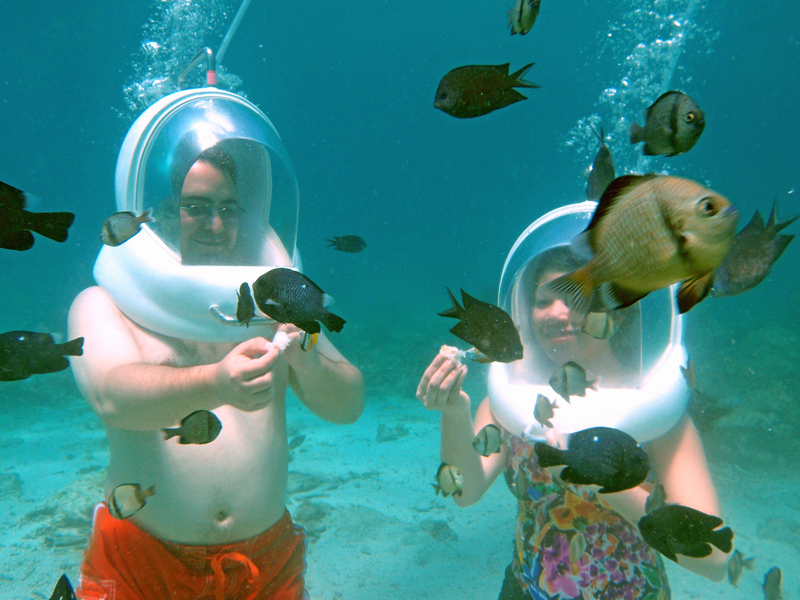 I hear you about freaking out a little, it even takes a moment when we go snorkeling to settle in to the water. My kids almost tried the helmet diving on a recent trip to Mexico, but we didn't have time. Never done any type of diving let along helmet diving. Sounds like fun and something I would enjoy. Might have to look into this type of diving. I love the idea of helmet diving it looks like it would be more comfortable than the normal breathing apparatus, I remember vividly panicking and hitting the button on one when I was a child and getting told off so I've always been put off. I did not even know this was a thing! Im taking a cruise this month and going to see if this will be available for me to try! I've never done any type of diving. I hadn't heard of helmet diving but it looks like a blast. This looks like so much fun. I had actually never heard of helmet diving before this post, but it looks neat. I wish I could try something like this but I just can't put my head under water. Looks so fun. Wow! That is so cool. I'm afraid of open water like this, but I think I might be able to do this without freaking out too much. How fun to see the ocean in this way. I feel the same way, being under the water is not my favorite thing to do. But it's nice that I overcome that fear and eventually enjoying the experience. Sailing away as the sun sets in the horizon is definitely a mesmerizing experience. Add to that helmet driving and the fascinating underwater world, makes it really a great time. How sweet is this! I haven't experience this kind of activity with my husband! That helmet diving looks SO COOL! One of the reasons why I don't dive or snorkel is because I have trouble with the mouth mechanics and I feel like these helmets would solve that problem! I am surprise either , on how this open helmet keep the water out. We had a blast though. That was a great escape in Boracay! 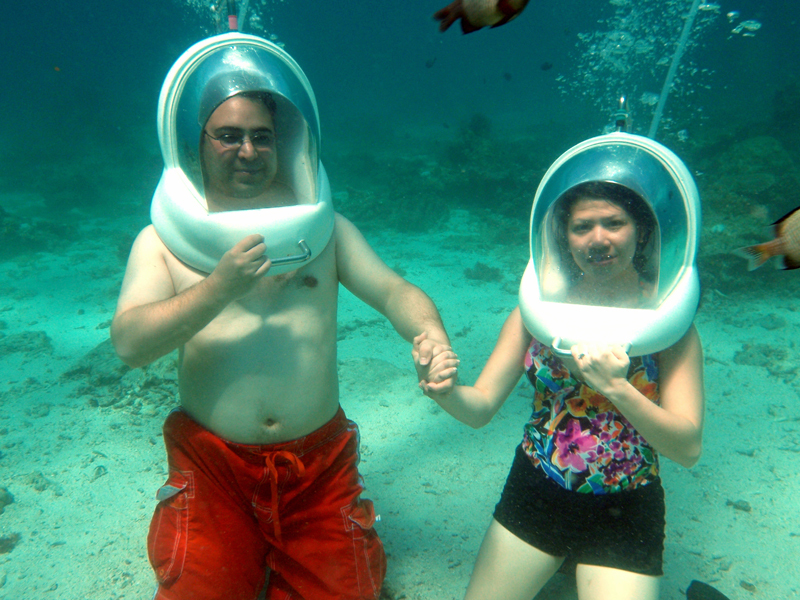 I went thru helmet diving also last Dec 2011 in Boracay but the pics and videos aren't as clear as yours. Great capture, mas clear mas maraming fishes.. Nice blog btw, following you..
Boracay is just world class. I'd been to Jamaica before Boracay, and my husband was telling me then that Boracay is so much more beautiful than the Caribbean. I didn't believe him then but when I went to Boracay, oh my gulay, there's just no point of comparing it. The fine white sands are to die for. 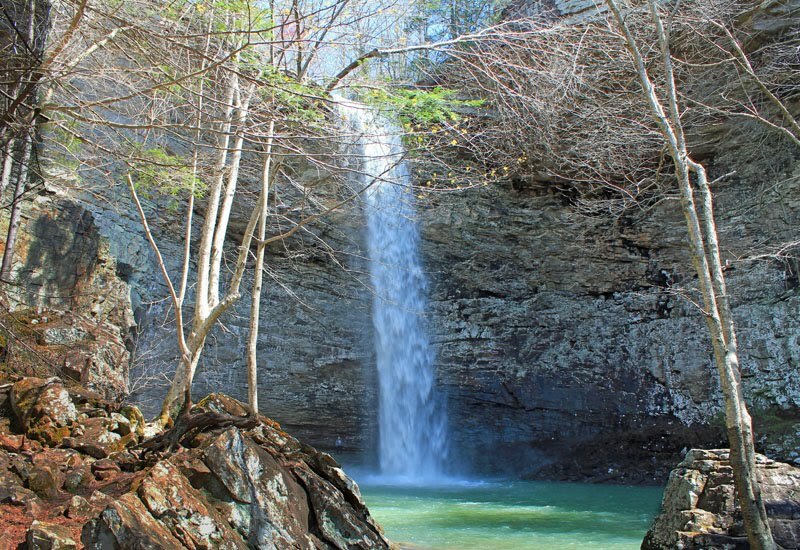 I hope the locals and tourists put their best efforts to preserve the place. WOw! Boracay truly is a paradise. It is a perfect place to be at this summer. I was there last 2008 and I hope to be back there to try the seawater fun. I would love to try this helmet diving.